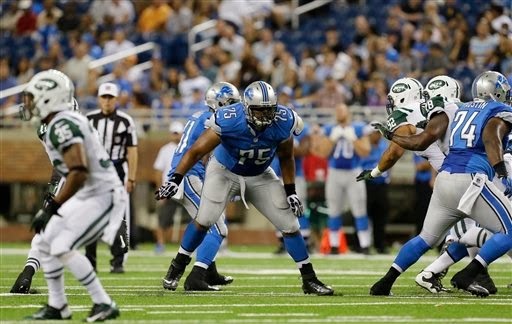 Larry Warford made an immediate impact at Detroit Lions' rookie minicamp last May. His size alone — 6-foot-3, 333 pounds — makes the third-round draft pick a standout. We all know how it worked out. In training camp and the preseason Warford earned the start at right guard and was solid throughout the season. He was surprisingly omitted from the Pro Bowl, but his play did get noticed. Warford was named offensive rookie of the year by Pro Football Focus on Wednesday. He finished ahead of Chargers wide receiver Keenan Allen, Packers running back Eddie Lacy and Cowboys center Travis Frederick. He’s just one member of the Lions' 2013 draft class, that has excelled. Hours before the Pro Bowl members were named in late December, Warford talked to reporters and didn’t seem too concerned one way or the other. He had no plans to watch the announcement. And a trip to Hawaii? He’s been planning on stopping on the islands on his way to visit his mother in Samoa. He said it’s been about six years since he had seen her — that’s a long time for someone who is just 22. Imagine the tales he will have to tell her.